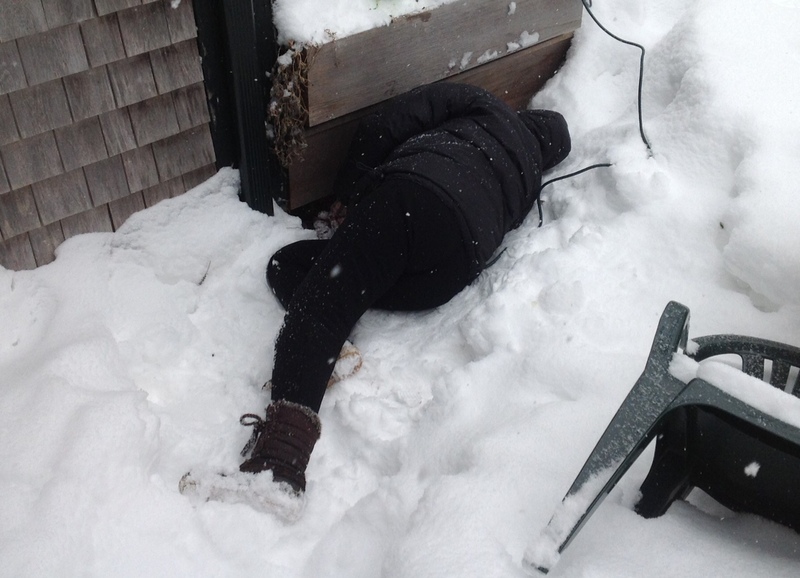 Being snowbound on the Vineyard is a new experience for Howie. He gave up sunny California to make his home with me on what I’d assured him was a gentle island. 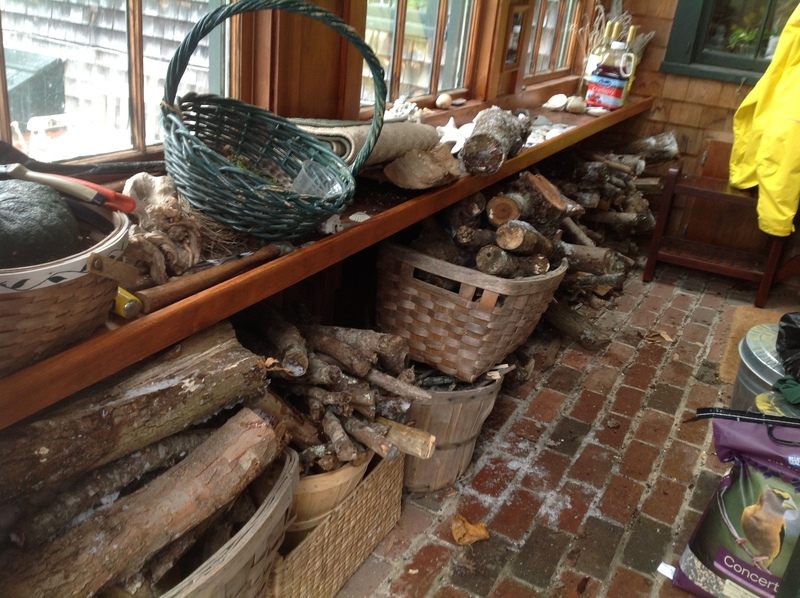 The temperatures on Martha’s Vineyard seldom go as low as 20 degrees, I remember telling him. We get maybe six snowstorms a year, usually no more than three to six inches, and it’s all gone in three days. The snowdrops are in bloom by the first week of February, I said. We are in the third week of February, and the poor snowdrops are buried under three inches of glacial ice and four-foot drifts of crystallizing snow that fell back in January. Last night, another foot of snow dumped on us. The temperatures are hovering between 2 and 19 degrees F. Town and state workers are out there clearing the main roads as the snow falls. 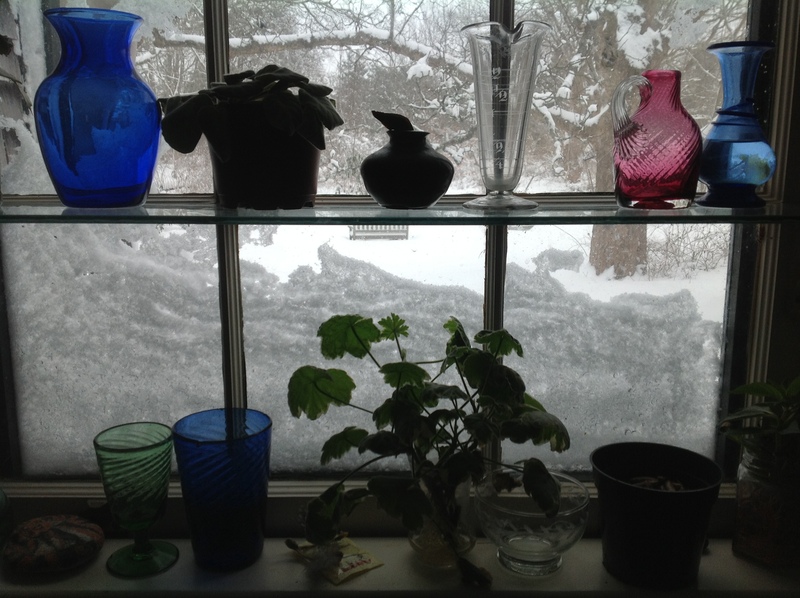 Last night we went to sleep hearing the distinctive sound of the trio of snowplows rumbling along the Edgartown Road. Although main roads are clear, our drive, a matter of a couple hundred feet from the house to the Edgartown Road, remains treacherous. The worst footing is at the base of the west step, where the snow has melted and refrozen into a pyramid of slick ice that has caused at least four tumbles, including by Howie and me. Fortunately, a four-foot snow bank softened the falls. 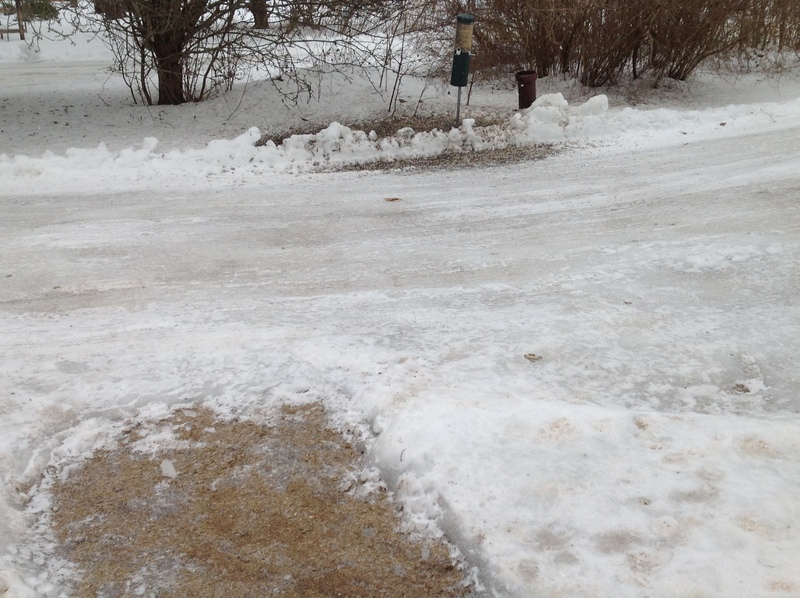 It seems odd to be blocked from freedom by such a short stretch of ice. We ventured out once, and realized it was not a sensible move on our part. On that expedition, we went to Cronig’s Up Island, where we exchanged snow stories with neighbors, showed off the YakTrax on the bottoms of our boots, and bought groceries, kitty litter, and birdseed — and more birdseed. Ninety dollars worth. 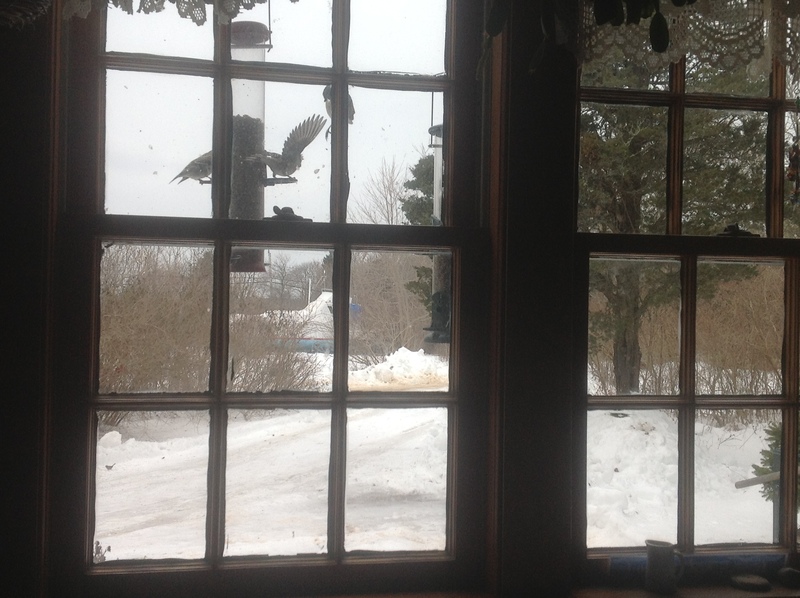 Our bird feeders, two hanging by the cookroom window and a large one across the drive have attracted birds desperate for food. We’ve counted more than fifty at a time. Seven cardinals, brilliant red against the white snow, show up morning, noon, and mid-day. The cardinals, goldfinches, and blue jays, add color to the drab gray and white landscape. 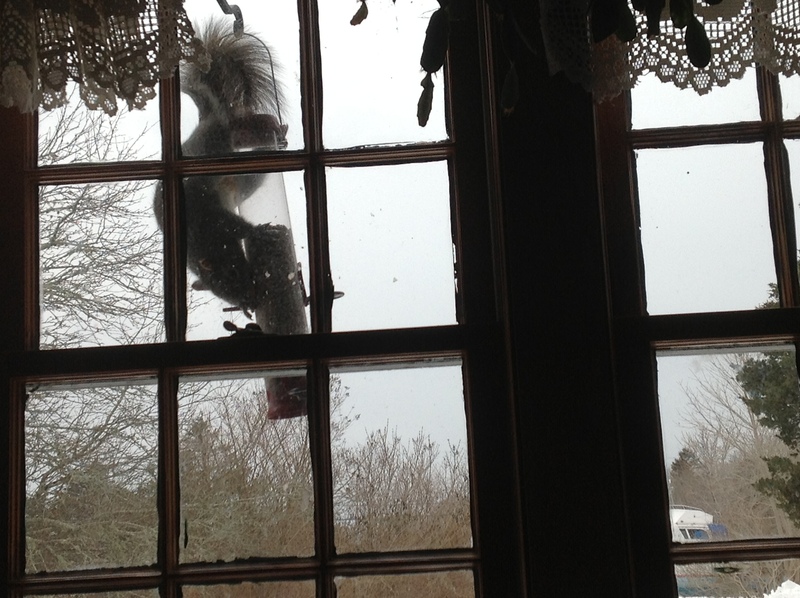 Two squirrels have joined the hungry mob, and birds and squirrels seem to get along. I make the trek to the empty feeder across the ice slick drive once a day, carrying a tote bag full of seeds that Howie has poured into it. Each time I feel, on a small scale, as though I’ve conquered the first twenty feet of Half Dome. Being snowbound has its advantages. All the chores we’ve put off to a better time are getting done. This is the better time that procrastination has led to. Organizing computer files, writing letters, indoor gardening, cleaning closets, adding those 5,000 words to my next book that my editor wants. . . The past weeks have made Howie and me, independent souls that we are, appreciate our neighbors and friends. 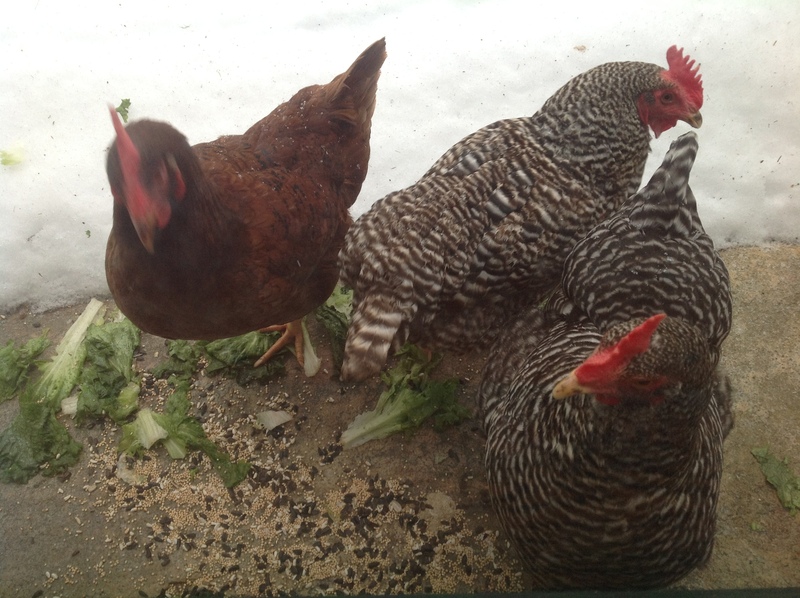 Lynn has been taking care of the hens and guineas. 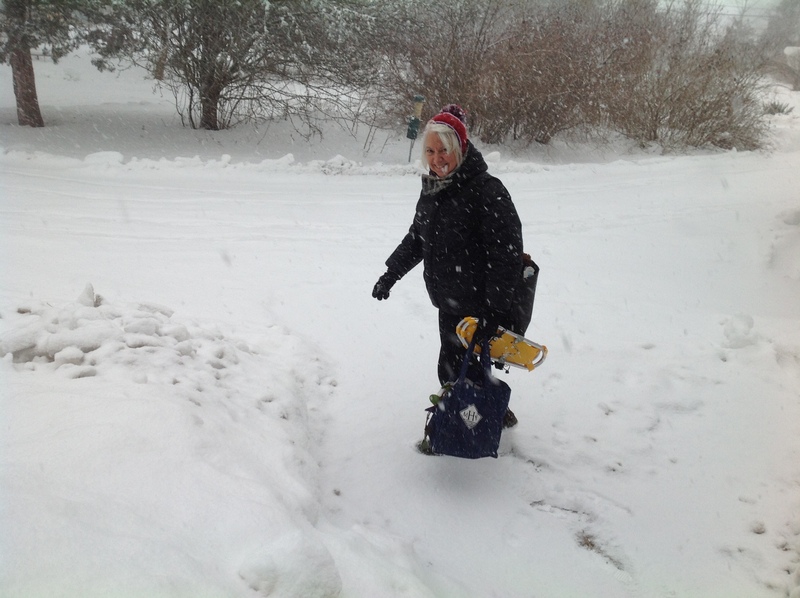 She crosses the hazardous ice fields to bring us eggs the hens have been laying dutifully. One of our hens, Lady Gaga, decided to take shelter under the porch. Lynn, unable to coax her out, installed a light to keep her warm and brings her food and water. Chris came by yesterday to ask Howie for advice on some microbiological problem he has, but actually, I suspect it was to make sure we were all right. 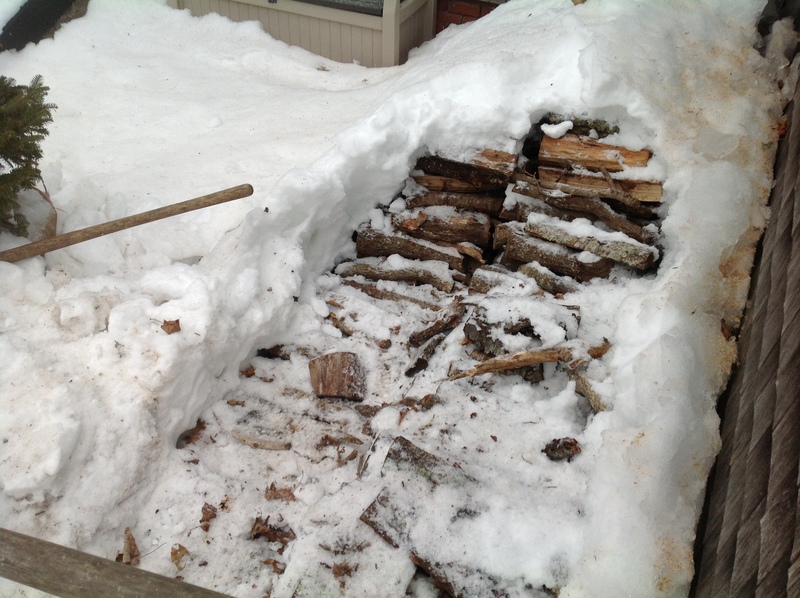 He extracted several armloads of wood from the frozen woodpile on the west step and stacked in the entry, where we can get to the firewood without going outside. Kevin’s snowplow couldn’t deal with the drifts in our drive, so he sent his brother, Joe, with his Bobcat to clear it. Dan came by with a petition for us to sign and to ask how we were doing. David, our nephew, called a few minutes ago to ask if we needed help. Mark called, promising to surprise us with a visit. Our lawyer has come by twice to make sure the revision of my will is what I want. I do wonder about that. Off season, in difficult times, our Island is a very small community.